You're invited: If you're in D.C., please join me Thursday at 8 a.m. for a conversation about workforce development and the news of the day with Ivanka Trump, White House senior adviser, and Mark Weinberger, global chairman and CEO of EY. RSVP here. CNN: 100-degree temperatures; no rain in forecast. 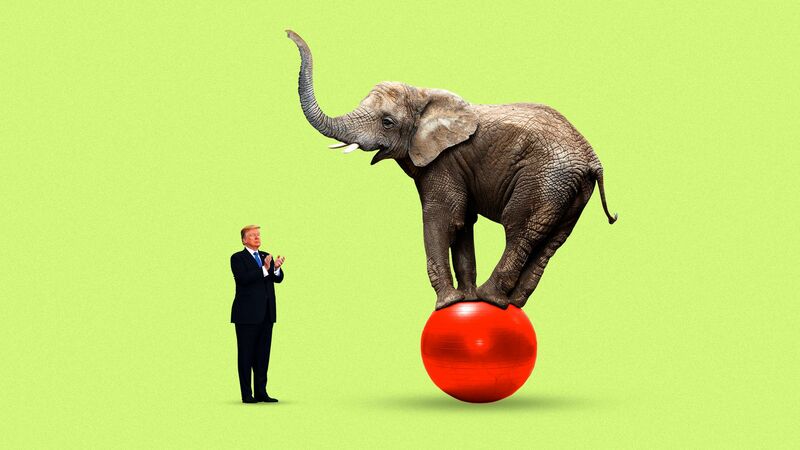 President Trump's power over politics and the Republican Party is growing, with more GOP candidates adopting his tactics and relying on his seal of approval to win. For a party defined for a lifetime by cutting taxes and regulation, numerous GOP candidates are instead choosing to run ads on Trump topics like crime, gangs and illegal immigration. Entire races — and states — are defined by Trump. In Georgia, Brian Kemp, a Trump clone who rants about fake media, immigrants and crime, crushed the establishment-backed Republican to win the GOP primary. Now, the Peach State will choose between Stacey Abrams, a liberal African American woman, and a conservative white man. Trump-backed candidates have won nine of the last 10 contested races, including all primary races. National Journal’s Josh Kraushaar calls it a “golden touch,” magically turning long-shot hardliners into instant favorites. Only last month, Adam Putnam — "Florida's agriculture commissioner and a genial conservative tabbed for political stardom since he won a state house seat at 22 — was ahead of Representative Ron DeSantis in fund-raising, local endorsements and opinion polls," the N.Y. Times' Jonathan Martin reports. "But then Mr. Trump bestowed his formal blessing on Mr. DeSantis for the Aug. 28 primary." Now a Mason-Dixon poll has DeSantis 12 points ahead, a month before the primary. YouTube of new DeSantis ad, which got a ton of play yesterday. A source close to the president told me: "Trump loves nothing more than raw, power politics. He knows he's got unprecedented juice with the Republican base, so he's flexing his muscle, and having a blast doing it." His sway often flows from fear: Fear that he will tweet against you and turn you into a soon-t0-be ex-congressman, like he did with Mark Sanford in South Carolina. Or fear his base will retaliate, unprompted. He has a powerful hold on his supporters' minds. A CBS News Battleground Tracker poll, conducted by YouGov and released Sunday, asked who you trust for accurate information. Among strong Trump supporters, the stunning result: Trump: 91% ... Friends & Family 63% ... Mainstream Media 11%. He has redefined the social issues that animate the Republican base from religious-rooted moral issues (abortion, gay marriage and "family values") to cultural issues rooted in class and race (immigration, crime and trade). He plucks candidates from relative obscurity and instantly turns them into household names in their districts or states — with a tweet, a rally or an endorsement. Because of his supporters' fervor, in a state like Alabama, he can quickly change opinions that were formed by voters over years, even decades. "If you're a Trump-skeptical Republican, you have 3 options if you speak your mind publicly: 1) Retire. 2) Be forced into retirement in your next primary. 3) Become a CNN/MSNBC commentator." Be smart: Trump-style politics might very well outlive this presidency, making him the most consequential GOP president since Ronald Reagan. "The Trump administration is considering bypassing Congress to grant a $100 billion tax cut mainly to the wealthy, a legally tenuous maneuver that would cut capital gains taxation and fulfill a long-held ambition of many investors and conservatives," the N.Y. Times' Alan Rappeport and Jim Tankersley report. "The Treasury Department could change the definition of 'cost' for calculating capital gains, allowing taxpayers to adjust the initial value of an asset, such as a home or a share of stock, for inflation when it sells." An example: "If a high earner spent $100,000 on stock in 1980, then sold it for $1 million today, she would owe taxes on $900,000. But if her original purchase price was adjusted for inflation, it would be about $300,000, reducing her taxable 'gain' to $700,000. That would save the investor $40,000." Why it matters, from WashPost's Damian Paletta: "[T]he use of executive power on such a significant change to the tax law would be highly unusual and could be vulnerable to a legal challenge." "Senior administration officials have discussed whether to proceed but have not concluded they have legal authority to do so." "The move was rejected during the George H.W. Bush administration because it was seen as outside the scope of Treasury’s authority and only attainable via an act of Congress." Why it matters: Collective media bias can dramatically skew coverage for the majority of the population, and can distort the truth by inflating or downplaying significant aspects of some news stories. Terrorism: A new study, detailed in The Guardian, found that terrorist attacks committed by Muslim extremists receive 357% more U.S. press coverage than those committed by non-Muslims. Hurricanes: A WashPost report found that in the same time period last September and October, Hurricane Maria in Puerto Rico received only a third as many mentions in text as Hurricanes Harvey and Irma on the mainland. Missing girls: The lack of media coverage of 10 missing minority girls in Washington, D.C. sparked outrage last year. Vox: "Even though children of color go missing more often than white children, they receive far less media coverage and public attention." Even climate change, a hot digital topic, often struggles to get coverage on cable news. MSNBC anchor Chris Hayes tweeted last week that "almost without exception. every single time we've covered it's been a palpable ratings killer. so the incentives are not great." "[T]he interests and concerns of less privileged groups (by class, religion, region, race, gender, or sexuality) are downplayed or ignored." 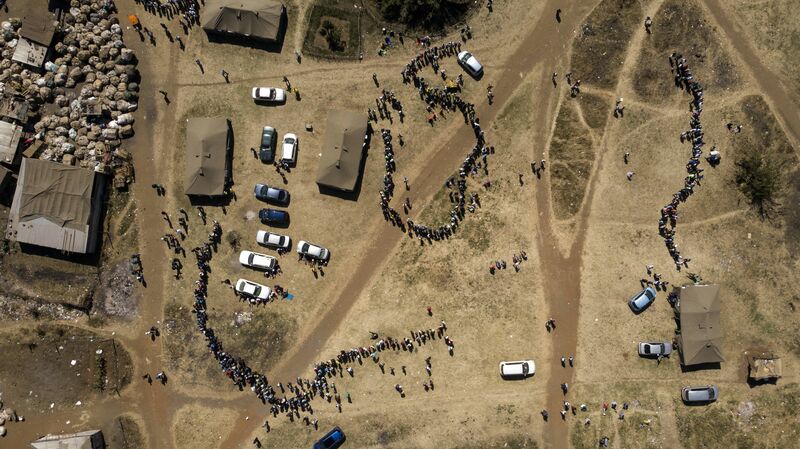 People wait in a queue to cast their vote in Harare, the capital of Zimbabwe, landlocked in southern Africa. 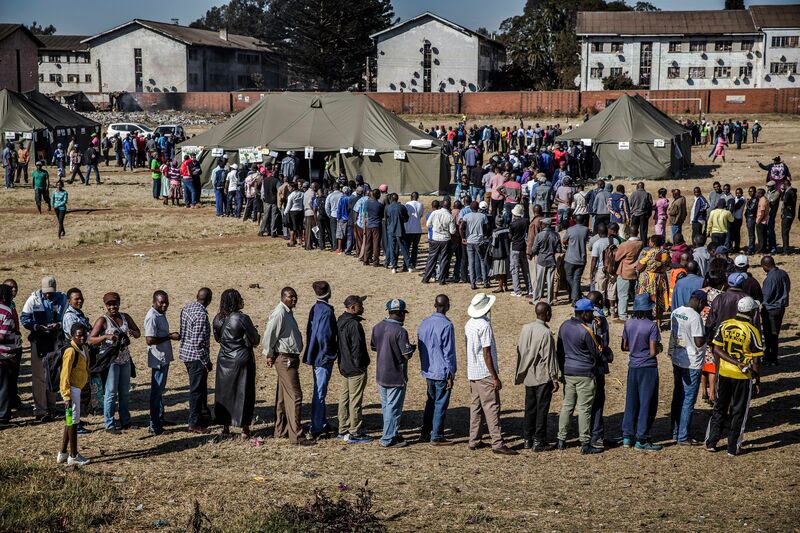 Millions of Zimbabweans voted peacefully yesterday in their first election since the rapid fall last year of ruthless Robert Mugabe, who ruled for 37 years. America isn't a socialist nation, and the Democratic Party isn't a socialist party. But after Alexandria Ocasio-Cortez’s shock win in New York, a growing number of Democrats are pushing a formula to try to nudge the nation and the party in Bernie Sanders' direction, Axios' Alexi McCammond reports from Michigan. Find candidates who fit the rising Democratic coalitions: young, female, minority — ideally all three. Go big or go home with policy fights: Medicare for All, a much higher minimum wage, a down-with-corporations regulatory push. Bet that the Trump phenomenon is transferable — that political parties are open to swifter change than commonly believed, as long as you are loud and authentic. Bring in Bernie. He remains a rock star with the far left, and a sure bet to juice crowds and attention. And Ocasio-Cortez was just in California spreading the Democratic socialist message. Why it matters: Ocasio-Cortez and the candidates she has endorsed are trying to blow up the Democratic Party. Yes, they're angry about Trump,. But they're more fed up with "establishment" Democrats who they say aren't working hard enough for the people. 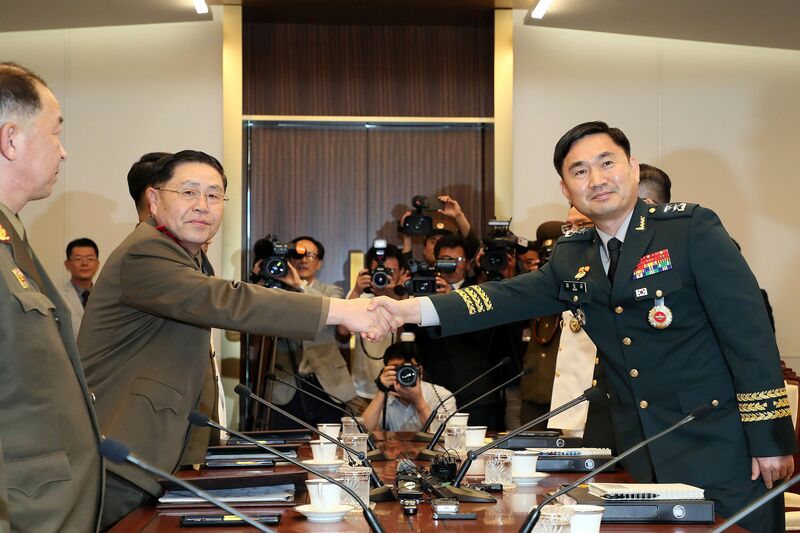 "[S]atellite photos taken in recent weeks [indicate] that work is underway on at least one and possibly two liquid-fueled ICBMs at a large research facility in Sanumdong, on the outskirts of Pyongyang." Why it matters: "The findings are the latest to show ongoing activity inside North Korea’s nuclear and missile facilities at a time when the country’s leaders are engaged in arms talks with the United States." "I believe in meeting. I would certainly meet with Iran if they wanted to meet. I don’t know that they’re ready yet. They’re having a hard time right now. ... No preconditions." "The Pension Hole for U.S. Cities and States Is the Size of Japan’s Economy," per The Wall Street Journal's Sarah Krouse (subscription). Why it matters: "Many retirement funds could face insolvency unless governments increase taxes, divert funds or persuade workers to relinquish money they are owed." "Drawing from hundreds of hours of interviews with firsthand sources, contemporaneous meeting notes, files, documents and personal diaries, FEAR brings to light the explosive debates that drive decision-making in the Oval Office, the Situation Room, Air Force One and the White House residence." 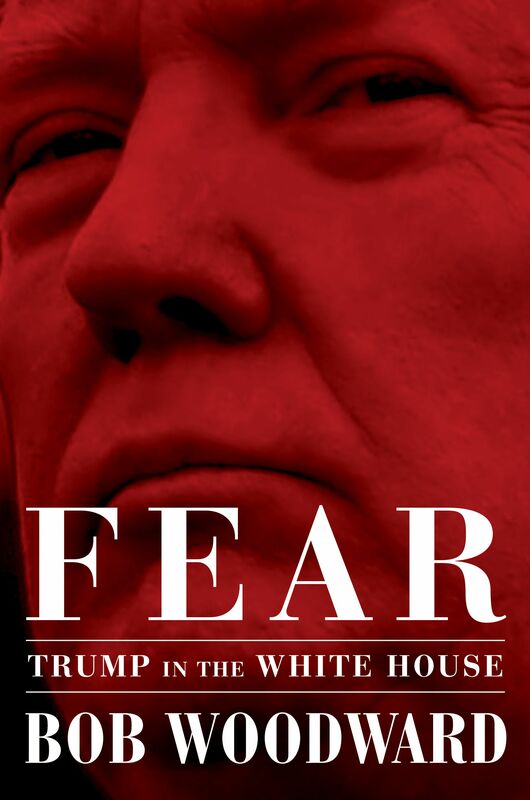 Jonathan Karp, president and publisher of Simon & Schuster: "'FEAR is the most acute and penetrating portrait of a sitting president ever published during the first years of an administration." "FEAR is Woodward’s 19th book with Simon & Schuster, beginning with 'All the President’s Men' in 1974. Each of the previous 18 books he authored or co-authored has been a national nonfiction bestseller. Twelve of those have been #1 national bestsellers." Alice Mayhew is the editor. Woodward was represented by Robert Barnett. The WashPost's Manuel Roig-Franzia writes on the Style front that the "expected tenor of the book is underscored by its unsettling cover, an extreme close-up of a squinty-eyed Trump depicted through a gauzy red filter." "The hush-hush project derives its title from an offhand remark that then-candidate Trump made in an interview with Woodward and Post political reporter Robert Costa in April 2016." Trump said: "Real power is, I don’t even want to use the word: 'Fear.'" 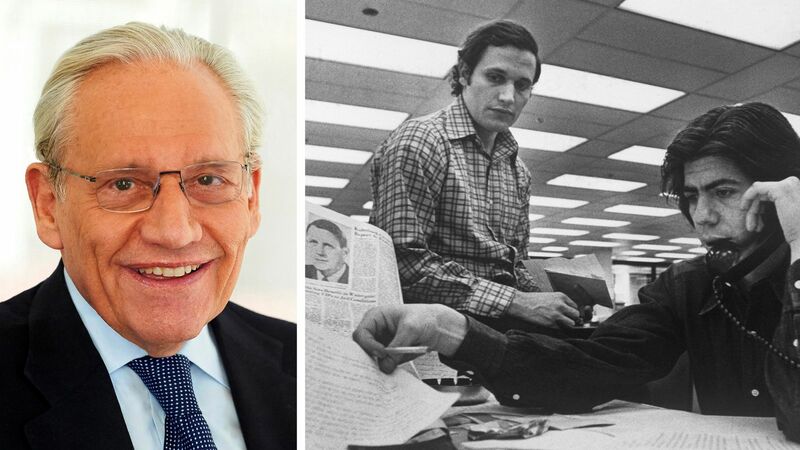 "Woodward ... has privately described the remark as 'an almost Shakespearean aside.'" 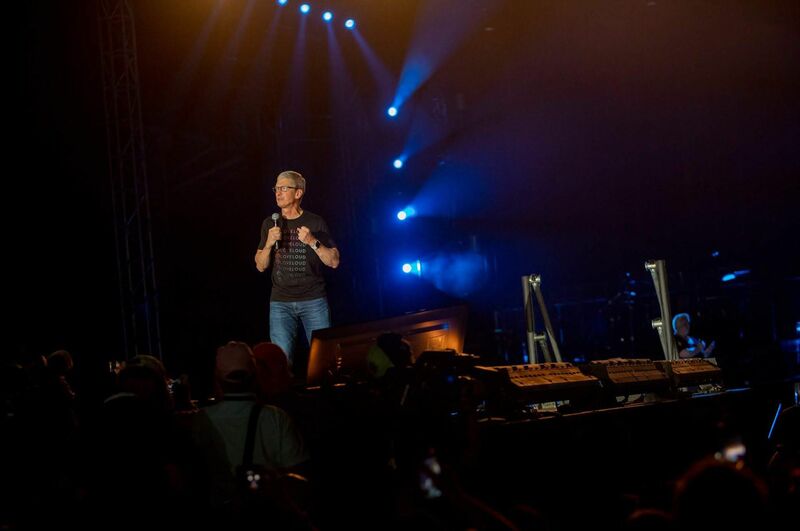 Apple CEO Tim Cook surprised young concertgoers in Salt Lake City this weekend at the LOVELOUD music festival, created by Dan Reynolds, lead singer of Imagine Dragons, "to help ignite the relevant and vital conversation of what it means to unconditionally love, understand, accept and support LGBTQ+ youth." Suicide is the leading cause of death for Utah adolescents age 10 to 17. Cook had a message of acceptance, designed to help kids find healing. An associate tells me: "In a society increasingly filled with darkness, it’s fulfilling to help bring some light." "Using dating apps like Match.com, Tinder and OKCupid ... to network — and in some cases even land a job — ... [is] slowly becoming more common." "The world of online dating is a great social leveler. [Dates] give people time with corporate higher flyers who they may not have had a chance of meeting otherwise." "People recognize that getting face time with someone who can help them move up the career ladder should not be a wasted opportunity." "If they don’t find love on their next date, what’s wrong with dropping a few hints about what skills and hopes they have for their professional future?" P.S. "Dating sites are also branching out into the jobs market. Some former Tinder executives recently created Ripple, an app designed to compete with LinkedIn ... Last year, Bumble launched Bumble Bizz." Thanks for reading. Live updates all day in the Axios stream.